I've just been reading some excellent research by Orion Partners (www.orionpartners.co.uk, www.hrbusinesspartner.com) including a chapter from their report, 'Transforming HR', Gower, 2006, called 'The New HR Model' and available at www.orionpartners.co.uk/downloads/Transforming_HR_ch2.pdf. This report rightly observes that yes, HR practitioners must have the credibility to engage with the business and they must be accepted into the management team in order to understand its objectives and provide direction; but they also need a deeper (functional) skill set than the technical one they previously held (eg legal and process compliance). 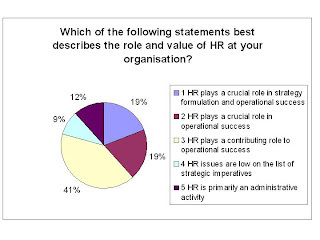 HR doesn't achieve its objectives if it just becomes too much like the rest of the business. "The issue of preventing the HR BPs 'going native' is key. As they do so, the HR function begins to lose its integrity of strategy and thinking. This also represents a real risk in that it can be viewed by employees as compromising the role of HR as 'Employee Champion'. HR becomes too closely aligned with 'management'. >I'm not arguing that HR shouldn't be up to speed with the business; of course, it needs to be. But it also needs to do much more than this if it's to play a fully strategic role. This for me is the current high water mark in HR thinking... can we go any higher or is google just not working at the moment?? ?